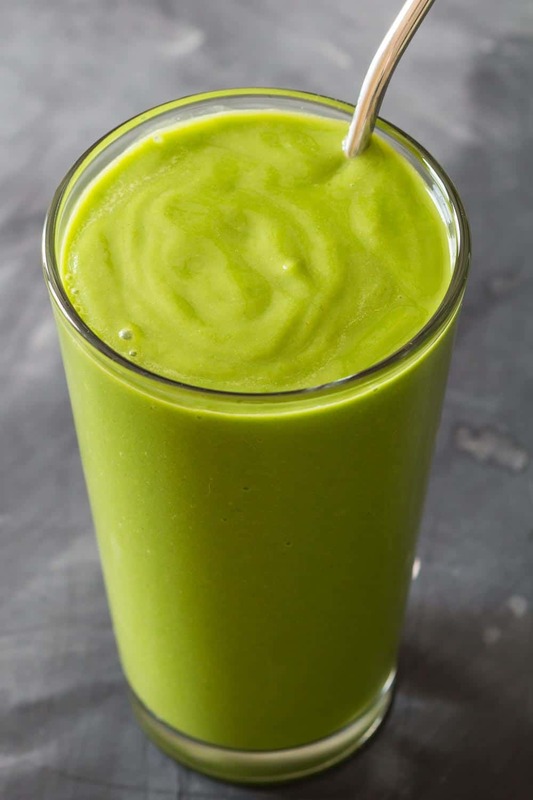 This Avocado Spinach Smoothie is the creamiest green smoothie you’ll ever try. Plus, the mango gives it a super sweet tropical taste! YUM! I’ve been wanting to create a green smoothie containing avocado forever now. I just couldn’t quite wrap my head around what else to add. This is a smoothie without yogurt, without juice and fairly low in sugar, while still super sweet. Let’s see if I can create smoothies with all the colors of the rainbow. 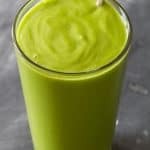 I started with this amazing Strawberry Smoothie Without Yogurt and now we have a green one to add. What color will be next do you think? it shouldn’t taste like grass. (Unless you love grass flavor of course, does anybody?!?). Add at least one leafy green. I love baby spinach for smoothies because it has a very mild flavor. Add a “sweetener” to remove the grassy flavor of the green. I love tropical fruits like mango or pineapple because they taste super sweet while still being considered low glycemic (i.e. low in fruit sugar). Add a little bit of protein powder to your smoothies. I’ve started doing this I don’t have to worry about my protein intake in the morning and just get my full “meal” in in one shot so to speak. Avocados are incredibly nutritious. They contain a lot of potassium and are loaded with fibre. They are very high in fat but “the good fat” ;) The one you WANT in your diet. The one that do not rise bad cholesterol levels. So that being said, it has yet another benefit. A taste benefit. They taste SPECTACULAR and make smoothies creamier than the creamiest cream you’ve ever tasted. I’ve always loved avocado for its taste and texture but adding it to a smoothie brings the smoothie experience to a whole new level. It’s like drinking a yogurt drink. 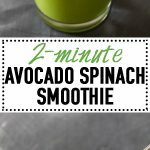 Can I store avocado spinach smoothie? I’m afraid no. I mean you can of course if you like brown-ish smoothies. Ewww! Avocado oxidices pretty fast and I recommend drinking the smoothie right after making it. I can’t recommend a specific brand yet. I’m still testing different ones to find out which one I like best but always look out for unsweetened varieties. I like hemp protein powders so far for their Omega 3 fatty acids. A VERY important not though. 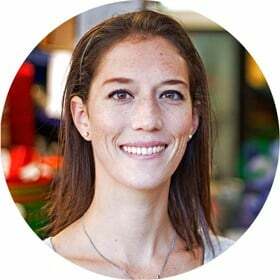 Protein powders will never be better than whole foods providing protein. Don’t use it as complete replacement throughout the day. Rather like an extra nutrition boost on top of your healthy nutritionally balanced diet. 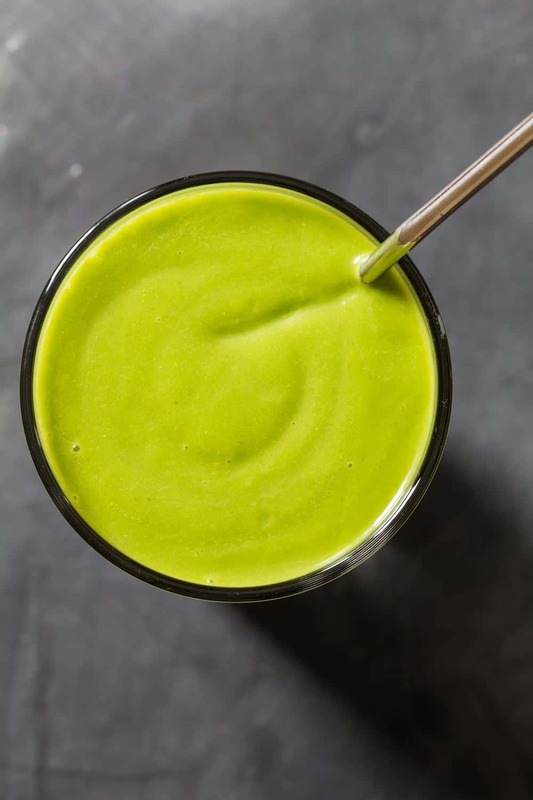 This Avocado Spinach Smoothie is the creamiest green smoothie you'll ever try. Plus, the mango gives it a super sweet tropical taste! YUM! Add all ingredients to your blender. Blend until smooth. Enjoy immediately.